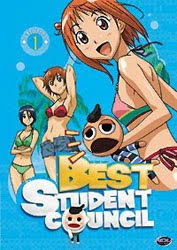 The Anime Archivist: Video Backlog: "Best Student Council"
Video Backlog: "Best Student Council"
Story Outline: High schooler Rino Rando’s mother suddenly dies so she transfers to Miyagami Private Academy with the sponsorship of her pen pal, Mr Poppit, whom she has never actually met. Unfortunately upon her arrival she discovers that the apartment building she was to be living in has burnt down. However on the first day at the new school, she is mysteriously voted onto the student council (the Miyagami Academy Maximum Authority Wielding Best Student Council, also known as the Best Student Council) where she becomes Secretary (despite really being unsuitable for the job) and has her accommodation, meals and tuition supplied and paid for as do the other members of the council. She strikes up an immediate friendship with Kanade Jinguuji, the president of the Student Council. Rino also has a puppet constantly on her hand, Pucchan, which people assume Rino is actually controlling, but seems to be actually possessed by the spirit of a man. Mini Review: What reviewers seem to often omit in their information about this show is that the anime is in fact a promotional tool for a game. Seriously. The story was developed by Konami, and because of this I had very little hope that the show would be any good. Boy I was wrong. The concept of the puppet Pucchan has a lot of comic potential. A lot. And they don’t waste any time using that potential. It’s strength lies in the comedy. However (somewhat of) a serious plot develops and there are a number of back stories to the multitude of Student Council members which are full of drama and almost take over from the comedy. The character designs are really quite nice too. They remind me more of shoujo anime rather than a show aimed at young men. There’s also a refreshing lack of fanservice. The arrival of a new character, Minamo Katsura, mid way through the series almost derails it, as well as the clichés of a number of characters, however in the end the show just about won me over. A really fun a surprising show. Certainly not the pinnacle of anime, but a lot of fun. 7 out of 10. Remaining Backlog: 18 months (it's much easier this way than listing the number of discs).